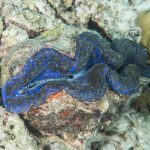 In this new series, “Inverts We Wish We Could Have”, I will showcase lesser known, unique invertebrates that are very rarely, or not at all, collected for the aquarium industry. 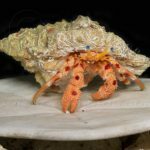 In this first installment of the series, I would like to introduce a newly described, incredibly striking species of hermit crab: The Candy Stripe Hermit Crab, Pylopaguropsis mollymullerae. There are currently twenty fully-described species in the genus Pylopaguropsis (including P. mollymullerae), most of which are found in the Pacific Ocean at varying depths. P. mollymullerae, however, was discovered in the waters surrounding the island of Bonaire, of the Lesser Antilles in the Caribbean, at a depth of 11.6-13.7 meters. These hermit crabs are very small; measuring between 0.9-2.4 mm in length and, like most hermit crabs, carry empty gastropod shells as shelter. Broadbanded Moray (Channomuraena vittata), Candy Stripe Hermit Crab (center), and Ocellate Swimming Crab (Achelous sebae). 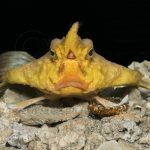 Ellen Muller, an avid diver, photographer, and environmentalist who documents marine life in Bonaire, initially discovered the remarkable P. mollymullerae. She first noticed several of them under rock overhangs frequented by the Flaming Reef Lobster, Enoplometopus antillensis. 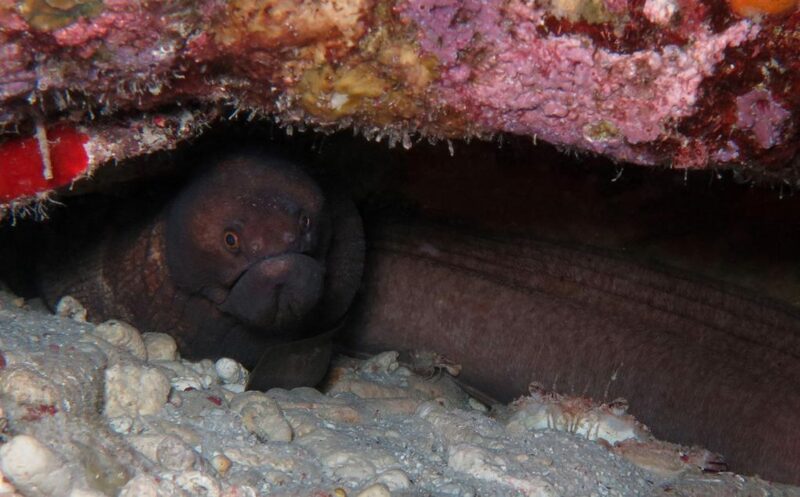 More individuals were also found under other rock overhangs where numerous moray eels are regularly observed by divers. 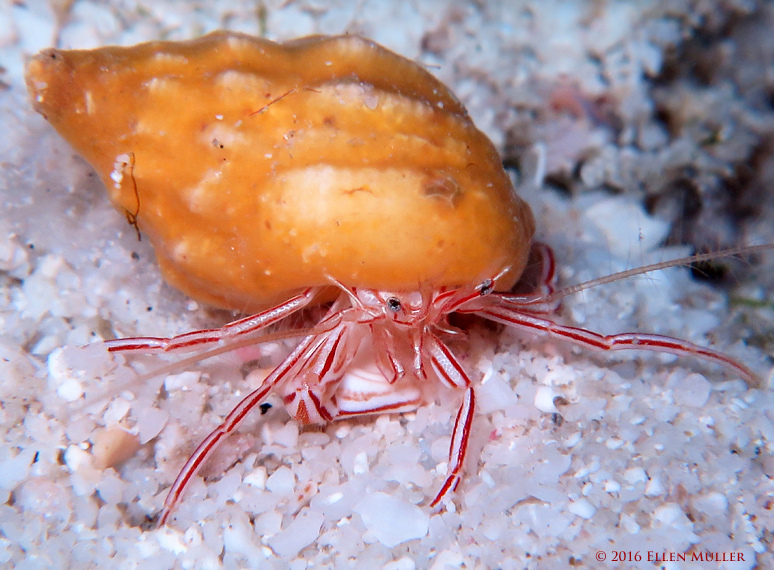 One hermit crab was even found crawling on the body of a moray eel, leading Dr. Rafael Lemaitre, who described P. mollymullerae, to speculate that this species may be a “cleaner”, functioning similarly to Cleaner Shrimp (Lysmata amboinensis), which remove dead tissue and parasites from fish. 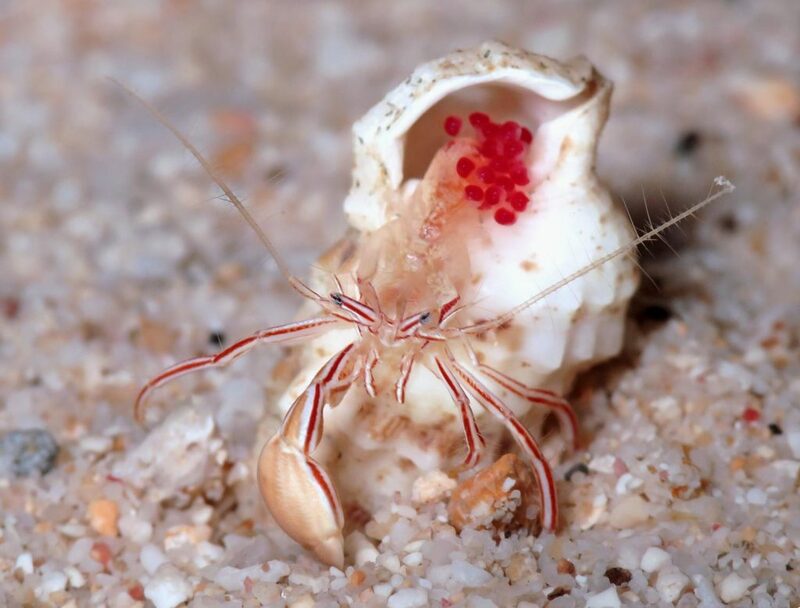 This possibility is reinforced by the striking red and white stripes covering the body, which is seen repeatedly in other invertebrates that function as “cleaners”. Another possible symbiotic relationship that P. mollymullerae may have is called “den commensalism” where the hermit crab lives in the “den” of a moray eel and scavenges leftover food not eaten by the eel. 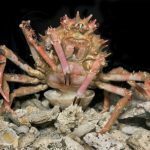 While this incredible gem of a hermit crab may seem like a perfect addition to a reef aquarium, it is important to note that the waters surrounding the island of Bonaire are protected from collection. 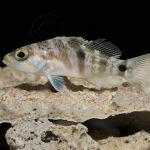 Special permits were required to collect the specimens for the description of the species, so collection of this species for the aquarium trade is currently not possible. This species also appears to be very reclusive, only being found in the dark shadows of rock outcrops, indicating that it would seldom be seen in a busy reef aquarium. 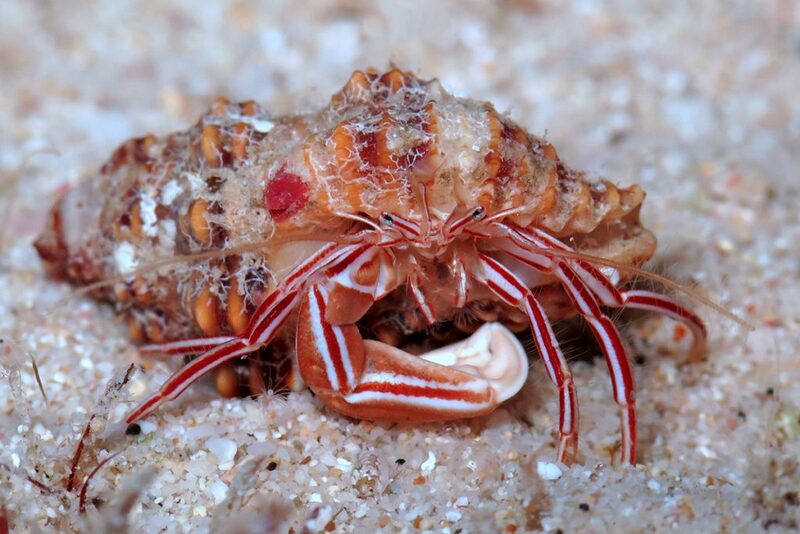 Instead, the Candy Stripe Hermit Crab is a species that we can all enjoy through underwater photography and maybe by diving while visiting in Bonaire one day. Gordon Greenley is a marine ornamental fish and invertebrate breeder who also specializes in nano fish, shrimp, ornamental macroalgae, and non-photosynthetic coral husbandry. Nice work Gordon Greenley. We are very excited about this new series! Stream Live Video Underwater with the New IceCap REEF-Cam!